Double parking is an unwelcomed possibility that many drivers have to face on a daily basis in every big city. Simply put, you are ‘guilty’ of double parking when you put your car alongside a vehicle that has already been parked on the roadside. Morally and legally speaking, double parking is a tricky issue. For that matter, we will discuss the dos and don’ts of double parking in this blog so that you are able to make a better judgment next time. Let’s start with discussing the conditions in which you can double park your vehicle. There are few conditions where double parking is legally acceptable. You can double park a vehicle if it’s dispatching parcels or you are somewhere attending a service call. However, traffic law experts associate double parking with these two conditions. You can only double park the vehicle if there is no free curb space on either side of the road to park the car within 100 meters of your current location. To measure in steps, you can double park a delivery or service vehicle if a free spot is not available within 100-130 walking steps. It is important to look around for traffic and law enforcement rules applicable to the given location. If they prescribe no parking at all, then the first condition will automatically be overridden. If you are picking up or dropping off passengers, then you can temporarily double park your car. However, this should be well within the grace period, which has an arbitrary value. We would recommend not staying for more than 7 minutes in a double parking position. Virtually, a vehicle should not be parked alongside the already parked car on a road pavement. However, there are some cases where it’s totally inexcusable to double park your vehicle. During rush hours, double parking a car even for a couple of minutes can lead to insane traffic jams. Besides avoiding DMV ticket, it’s not civil to double park your car during rush hours. 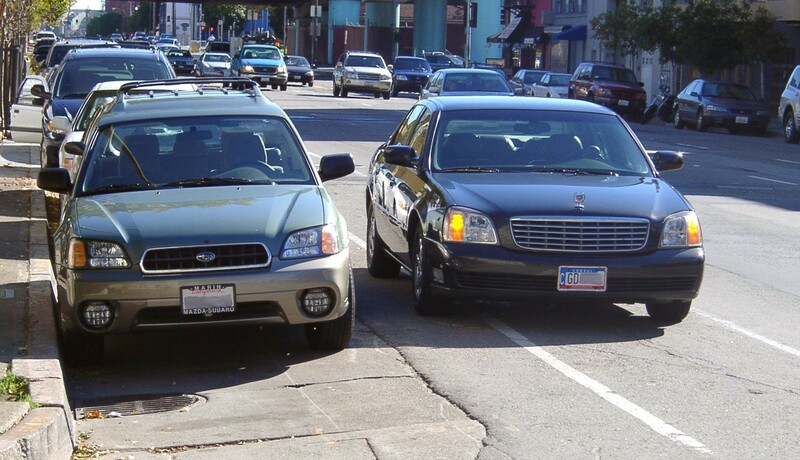 A private vehicle used for personal commute can’t be double parked in any case. How to Avoid Double Parking? There are several ways in which you can avoid double parking. Many times you just lose a legit parking spot because someone else arrives at the destination before you. Making a habit of leaving a couple of minutes early will help you in readily finding a legitimate and unoccupied parking spot. The Internet can also help you in this regard. There are some online portals that allow you to search for a parking spot in certain neighborhoods ahead of time. You can book your parking spot many days ahead of the actual commute to avoid all the parking shenanigans. What Happens When You Don’t Secure a Parking Spot in Advance?